Only to a newby are these free of. pick up Northern Suburbs. 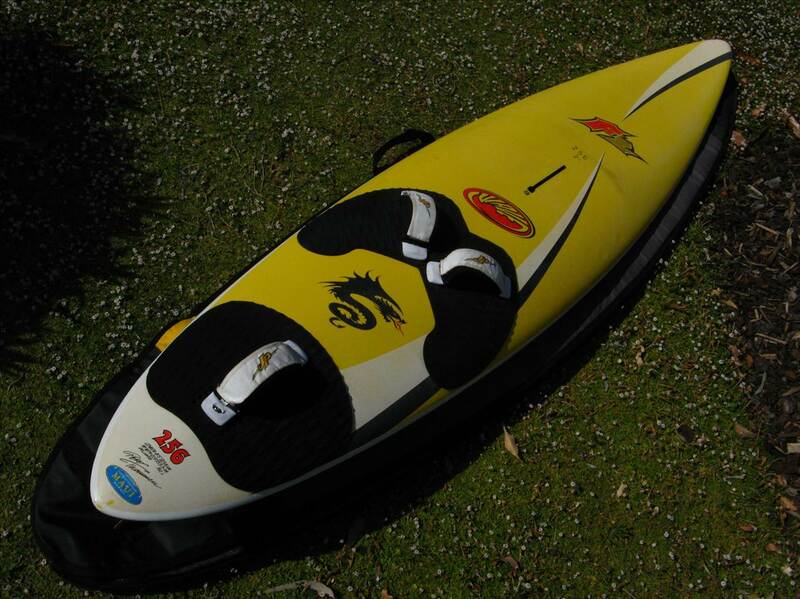 F2 Axxis 262, 85 litres, freewave board, in excellent condition, without footstraps - Available to pick up in Mosman Park. -Free to any good home, probably someone wanting to try a sail with cams for the first time without the cost outlay. PM me if interested, if you follow the wind round the river I may even be able to bring it to you. Arrows Impact 5.3 - Rigs on a 430 - small tear in luff pocket. KA Kult 4.7 - rigs on 400 - 30cm tear in window. I think the 4.5 has a small rip in on the main window. but besides that it's in good nic. 5m blade, 2011 i think, the first one with the new material in the top. but it has been robbed of batterns. Wow we're getting some good stuff here. Noobs and groms where are you? Gents, over 10 years ago I gave away all my sailing gear and moved over to the dark side. Over the last year I have started to see the light and have been keen to get back into the sport. Because of this thread I have been able put to together 3/4's of a rig which will allow me to ease back into things again. Now my only concern is making a sinker move which I am sure was much easier 10kg's ago. Thanks again for those who contributed. God bless you! Seriously, anything else you need? Ha, ha - all good thanks Mark. I manged to get a mast on seabreeze and extension at a local shop. I will go and hunt for footstraps and a fin for the F2 Axis (which is in perfect condition so by the way) on the weekend. Ps. Can't see anything wrong with that boom for Metro waves etc. Hello all, I'm new to Esperance and have not had much luck sourcing 2nd hand gear, whilst I've had a couple of lessons and understand some basics, if you guys know anyone around this area I'd appreciate an intro. Alternatively I see gear being offered for free pickup but I'm willing to pay for freight and extra for your time. I'm 187cm tall and weigh 115kg so even info on what I should be looking for would be a great help. I have hired the odd board in NZ and accidentally pulled off 2 deep water starts but don't know how and a spectacular crash from an attempted beach start. quarto 74 old style wave board at cockburn recycle centre, had a look, it's in good nick.. prob get it for $30..
Hi guys! anyone wants to part with an old (servicable) 5 or 5.5 sail? let me know! Thank you Marvin, it is going to a good home! I have a windtec slalom board at home. Maybe about 100-110L. I'm onsite right now but might be able to organise someone to pull it from the shed if required soon. Recently I was given a board and several sails to get me started. I bought the rest. But I've trying and I think the board I got its way to advanced for me(98L). If anyone is trying to get rid of a second hand board for beginners I will sure pay if the price is right. got a 2007 Acid 75litre in wood lite weight construction. nice blue/silver & wood. Its got a few dings, dongs due to me learning waves in a reef spot but still sails great and is water tight. Needs a new home, so for free..
Also a 2006 85 Naish all terrain. This is a awesome board and in great condition a very special board and has been my securely blanket board for many years when visiting new spots so cannot let it go for free, so need a a least a slab of beer for this one. I have the 2002 Starboard 76L Fish if anyone wants it? Very good condition. G'day dudes, I'm doing a spring clean and have a few boards to get rid of. That Kinetic would go like the clappers wouldn't it?